This is one of those exciting products that can change the way we do things. For The Better! 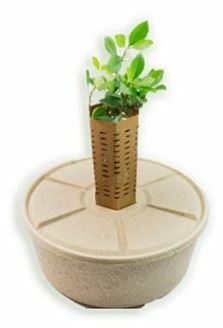 This very clever, fully biodegradable planting aid means that now you will USE 100x less water than traditional watering methods - 100X!! ▪ Greatly widens your planting window / opportunity – not just winter planting! And it that's not enough with every purchase of a COCOON® you will receive a free Bactivate microbial planting satchel, containing 5 beneficial native bacteria.